Big dreams. Solid goals. A vision for the future. Many of us hit the first few months of the year with high hopes and big ideas for breakthrough results. The one piece that historically sabotages our forward trajectory, however, is the conversations we have with ourselves. I’m a man of big dreams with a solid “can-do” attitude. Yet, despite having every reason in the world to feel on top of the world, there are times when I struggle with self-doubt and that nagging “imposter” feeling that plagues so many people. I can get overwhelmed when confronted by a wide spectrum of options and can find myself sometimes shutting down rather than powering up to meet the challenge. Start by being kinder to yourself. Speak to yourself at least as kindly as you would a friend or co-worker. Imagine saying some of the things you’ve said to yourself to another human being. You wouldn’t, right? So, stop saying them to yourself! Secondly, be more strategic with the questions you ask yourself. Questions are gateways to answers – whether they are positive or negative. It is important to think about how we pose those questions. Over the last several years, I’ve been on the journey of personal development that began by removing the four questions below from my daily conversation. The impact has been immense. I’d like to share them with you. Who cares? The more important question is, “How much money do I keep?” The world is filled with “poor” millionaires; those people who make a lot of money but don’t have a lot of money. “How much do I keep?” is the question we should be proud to answer on our path to success. If you are making $90,000 a year and spending every dime of it, that’s not growth. Ask yourself, “What can I do to keep more and spend less?” Strategists tell us to keep and invest 10-20% of our annual income. When you’re ready to move your life in a more successful direction, stop asking the short-term questions like, “How much do I make?” Start asking yourself how much more you can keep, then start taking action on your answers. How many books do I read? Again, who cares? I know people who read 50+ a year. In fact, I used to be one of them. Instead of focusing on a tally number you can brag about at a dinner party, ask yourself, “How much do I retain and implement?” I now focus on the three or four extraordinary books each year that I can read and pull incredible strategies from to transform my life, my business, or amplify the lessons that I teach to my audiences. The more empowering question would be, “What three books can I read this year that will be transformational for me personally, professionally, or both?” Find that answer, and you’re on your way! I can hear some people saying, “Ryan, how is this question related to business?” and it is one of my strongest beliefs that self-image determines your personal and professional outcomes. If you are riddled with self-doubt and loathing when you look in the mirror, how can you possibly bring your best self to your business and relationships? Stop obsessing over the daily scale number, change the conversation in your head, and start tapping into how you physically feel. Start making shifts to your diet. When you eat a meal, does it make you feel better or worse? Does it give you energy or make you feel lethargic? When you increase your water intake and decrease your sugar consumption, do you feel better or worse? Pay attention to what your body is telling you as you move more and sit less. Our worth and contribution to the world around us is not anchored in any number on any scale. Stop giving your weight the keys to the kingdom and start focusing on the daily proactive measures you can take to feel at your best. Guilty. This is one I’ve struggled with – hard. I used to consider myself the king of procrastination – and because of that I felt weighed down with the guilt that came with that crown. The game-changer for me was when I shifted my question to, “What ONE thing can I do right now?” For me, it eliminates the pressure and compels me to act. Even if it is one small step, it is still a step in the right direction. This is how you go from this year being “a” year to THE year to grow personally and professionally and live more abundantly and joyfully. The place to start is with the person in the mirror and the questions we are asking ourselves. How much do I make to…How much will I keep? How many books I’ve read to…How many books can I put into action this year? 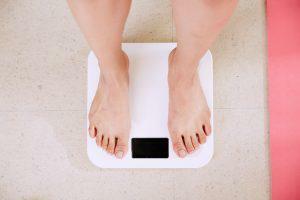 How much do I weigh to…How do I feel today? Why am I always procrastinating to…What is the one thing I can do right now? Shift the daily dialogue you have with yourself. Make your questions way less damning and way more strategic and mindful. When you do, the results may surprise you. Then they’ll delight you. Then, you’ll begin to have fun asking questions again, because you will know they are in direct correlation with the direction of your dreams.